Mars moves into Scorpio today and will stay there until January 26th. 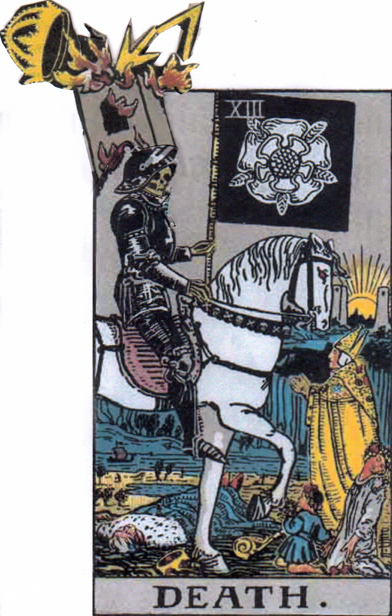 Looking at this transit through the eyes of the Tarot, it would be like the Tower’s lightening is striking Death. Transformation has been ignited. Mars in Scorpio, or the Tower’s lightening striking Death, can be a period of significant internal transformation. And change that was taking place slowly might start picking up speed. Be as open to the changes around you as you can, and courageous enough to face what you see. If an unexpected insight prompts you to reconsider aspects of your life – dive in and explore the situation fully. Have faith that endings will be followed by renewal, and dormancy replaced with something fresh and very much alive. You are currently reading Mars in Scorpio – The Tower’s Lightening Strikes Death at The Tarot Room.